Under new owners, this Blue Hills beach bar and grill has never been better! One of my favorite views on Providenciales comes as you round the curve into the seaside community of Blue Hills. After a rather nondescript ride from town, the sudden, brilliant views of turquoise ocean, with waves breaking over the reef, can leave you breathless. Continuing the trip, you’ll soon come to another bright spot on the horizon—the florescent lime green/orange buildings of Horse-eye Jack’s. Renovated, refreshed and rejuvenated by its new owner, the beach bar and grill offers welcome respite, good service and fantastic values in food and drink. Although the eatery has been on Provo since 2006, it has never looked (or tasted) better. Besides the obvious fresh paint job, new owner Dennis Pfister has spent over $120,000 to bring Horse-eye Jack’s back to life. His investment is most apparent in the huge burnished wood patio that sprawls over the property, from which you can step onto the beach or stroll to the thatched roof cabana bar. Besides offering plenty of room for parties and events, the graceful patio fits perfectly into the peaceful seascape, and is always cooled by brisk tradewinds. Madison Drake is Horse-eye Jack’s new managing partner. She hails from my hometown of Chicago, where she was immersed in the restaurant business for most of her adult life. She ran four restaurants on namesake Madison Street, and is well versed in what it takes to succeed in a very competitive and often mercurial business. She explains, “My approach is to give more in value than the price paid. It always seemed to be a winning combination. At Horse-eye Jack’s we’re offering a fresh approach to food and service. We have a fantastic location here for tourists and residents to relax, unwind and enjoy island food at its best.” It’s obvious that Madison brings a dose of Midwestern friendliness with her, as she smiles, circulates, chats and shows a sincere interest in the patrons. 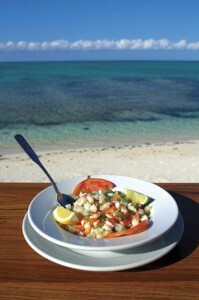 The simple menu includes island favorites such as conch fritters, conch salad and cracked conch, jerk pork and chicken, BBQ chicken and ribs and, of course, fresh fish (snapper and grouper) brought in by local fishermen and prepared to each diner’s specifications. Everything arrives hot and flavorful, (well, not the surprisingly popular “Spinning Bowl” of salad, which is cool and crunchy). This salad “construction zone” has grown legendary among visitors who have a hard time getting a good salad at most casual island eateries. At Horse-eye Jack’s it starts with a bowl of greens and diners choose from a variety of add-ins. To date, the “new” Horse-eye Jack’s is getting rave reviews from visitors and even finicky residents, who give the fare a “thumbs up.” (I can personally vouch for the hand-formed cheeseburger . . . perfect!) Madison points out the massive stone barbecue grill where the jerk entrees are cooked and notes the recent introduction of broasted chicken, the only place on the island where this delicacy can be found. Most menu items hover around the $10 mark, almost unheard of on pricey Providenciales. Also refreshing is the prompt, careful service, an obvious result of some serious training by Ms. Drake! 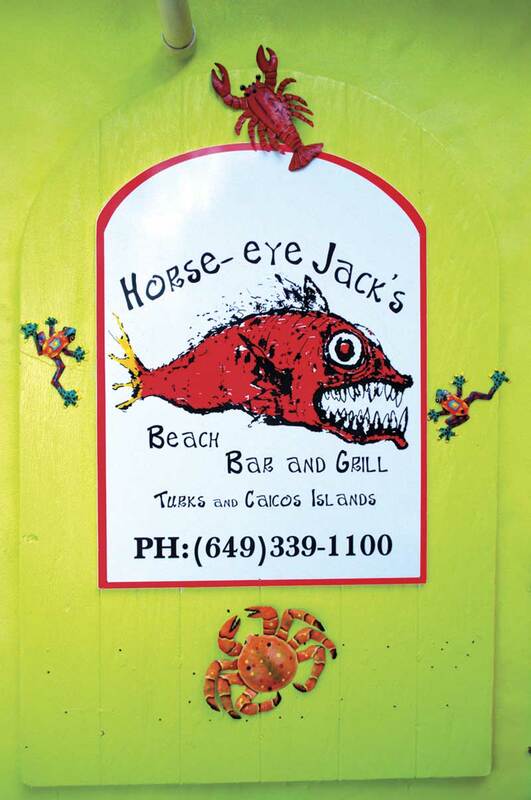 Part of the Madison’s strategy to urge local residents to visit and get to know the “new and improved” Horse-eye Jack’s are regular Wednesday party nights, which have grown increasingly popular. Starting from 5 PM, you’ll find discounted drinks (think $5 Mojitos, $4 beers, $18 buckets of beer and a free shot of Jager, Bambarra rum or tequila with tab over $50) and complimentary roast pig, cooked whole in a drum on premises. With live music and dancing, these and other regular events are a foreshadowing of private parties that can be thrown at the restaurant. Madison says, “We actually have space for over 1,000 guests for special events. Besides the beach patio, we now have a huge paved parking lot on which tents can be raised. It’s the perfect spot for a wedding reception, birthday party or business social.” With sparkling lights on the palm trees adding a fairyland touch, the venue is especially beautiful at sunset and into the evening. In fact, at press time, Horse-eye Jack’s was poised to host the Little Chef’s Charity Event and had recently welcomed 15 children for an etiquette class/tea party for CAPPA, the local Child Abuse Prevention and Awareness Association, a cause near and dear to Madison’s heart. And although the restaurant has been open since mid-February, it finally held its “official” grand opening in early May, themed “Howl at the Moon,” and complete with live entertainment, a beach bonfire and fireworks. Although I’m no longer a drinker, I recently sat at the bar admiring the laminated conch shell counter (also refurbished) and watching patrons savor the seriously spiked specialties, ranging from the lethal Piranha Bite to a frozen, layered sensation named after island legend Bugaloo (Boogie), with Mango Mojitos and “darn good” Bloody Marys also receiving accolades. For more information, visit www.horseeyejacks.com, look up HorseEyeJacks on Facebook or call 649 331-0421. It’s Dave Walker. You may remember me. My father Paul was a very good friend of yours. We all miss him dearly. My sister Debbie and I were thinking about visiting Turks and Caicos (with our spouses of course),and we’re wondering if you would be kind enough to give us some suggestions on a place to stay and things we may want to experience. 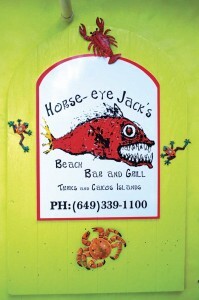 I here there is a great restaurant by the name of Horse-eye Jacks! Not sure how much of your time is spent in T and C, but it would sure be nice to catch up and have a few laughs. Looking at the end of January-early February for a visit. Your thoughts would be greatly appreciated.